In the summer of 2012, I was a research intern for the Virtual Reality Applications Lab at Iowa State University. During this internship, I received training and hands-on research experience in the field of Human Computer Interaction. I worked on an interdisciplinary team of three interns and spent ten weeks on a research project. Our team focused on how to improve distortion of depth perception in 3-D virtual environments. 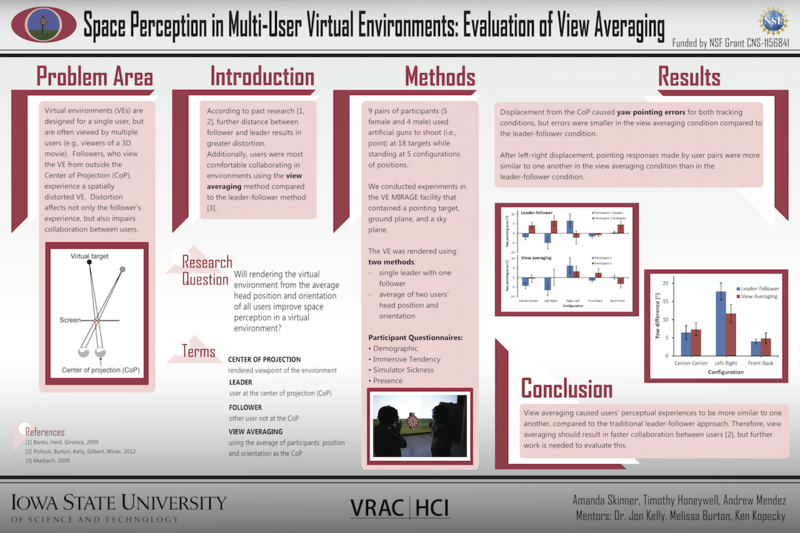 Our research problem was that when multiple users view virtual reality systems, improper display of stereo depth cues typically leads to perceived distortion of the space. To address the distortion followers experience in virtual environments, we chose to investigate whether rendering the virtual environment from the average head position and orientation of all users in a space improves their experience. Co-developed a View Averaging method and conducted a pilot study to evaluate how well our method minimized users’ depth distortion. Developed a data processing program in C++ to analyze vector trajectories from pilot study. Collaborated with team members to devise a method that decreased distortion by 34 percent.